Strength, honour and male virility! Associated with Kingship and Gods and Goddesses. Duir promises us the strength to speak the truth, to hold our ground and to live a life of courage. In Norse it was the Sacred tree of the Thor and in Greek sacred to Zeus. Both Thunder Gods! The Oak is possibly the most revered of all trees. We have an instinctive draw towards it. The word "Duir" is thought to derive from the sanskrit "DWR" meaning Door so it's no surprise that it's used in making a lot of doors, especially when it was believed to have the power to ward off evil spirits. Oak is a native tree to The British Isles and many meetings were held under The Oak Tree usually in the centre of the village or town. Oak as a firewood is super long burning due to it's slow growth. It's one of the least sustainable trees as it can grown for thousands of years and therefore should only be taken down when dead standing or there is a requirement for it to be felled. Oak is popular among customers who have a fast draw in their appliance and require a very hard hardwood log. It can be difficult to burn in some appliances depending on the air intake and size, in which case we recommend burning only after creating a good layer of hot embers. Birch and Oak together are an unbeatable combination! Birch to start give a flame, Oak to heat your heart and hame! A large quantity of Oak coming into stock and available for delivery with priority to pre-orders from Monday 26th of March 2018. 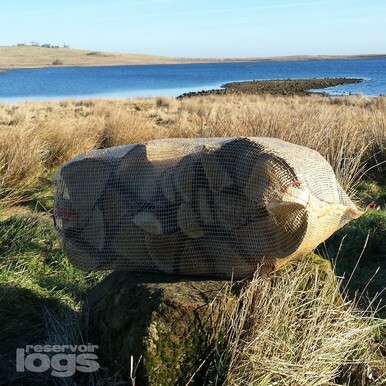 Logs are cut to 25cm lengths and packed into 40 Litre Nets.